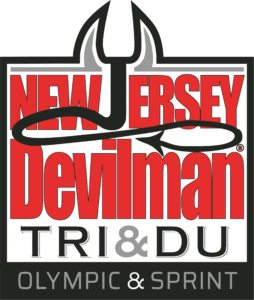 The New Jersey Devilman Triathlons are the first open water races of the season in the greater Philadelphia region and are staged out of beautiful Cedarville Recreation Complex in Cumberland County, NJ. Located in the south central part of the state, it is about an hour from Philadelphia. The lake is fairly small in size so warms up quickly once the weather breaks, plus it’s a short swim! Once you finish the swim you will hit the highlight of the race, the bike course. This course is pancake flat with wide shoulders and little to no traffic. You’ll ride by saltwater marshes, inland bays and pine plantations; it’s an amazing ride! The run course is also an out and back course along low-no traffic farm roads. 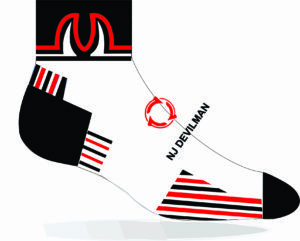 Be on the lookout for deer, birds and other abundant wildlife, maybe even the Jersey Devil himself! This is a fun, well run, low key early season race. There are tons of activities to keep your family occupied over the weekend, so spend some time exploring the local area. You can find more information on local attractions HERE, or view our race video HERE. Swim Course: The 1000 meter swim begins with an in water start on the south side of the transition area. Athletes will swim two (2) loops of a square shaped course and exit the water at the same location as they entered. The course will have 4 yellow turn buoys and orange sighting buoys will be located approximately every 75 meters. The lake is fairly small in size so warms up quickly once the weather breaks, plus its a relatively short swim! A temperature reading will be taken and posted the Thursday prior to the event. If athletes don’t want to swim, there is a duathlon option available. Bike Course: The Olympic bike course is a 24 mile ribbon of beautiful country. Once athletes leave the park there is exactly one turn, the turnaround point in bucolic Port Norris, home to the Bayshore Center and their sailing ship, AJ Meerlwald. This is a beautiful course and a lot of fun to ride. The roads are well paved, have large shoulders most of the way and have very little traffic. Be sure to check out the bike course preview video HERE. Run Course: The Olympic run course is an out and back on scenic, low traffic farm roads. There is no shade on this course, but you’ll see plenty of farm country and wildlife as you crush this completely flat course. Once you leave transition, you’ll cross main street and be in the country in about a 1/4 mile. It’s a beautiful run and not to be missed. There will be aid stations located every mile and mobile support if you need it. Swim Course: The 500 meter swim begins with an in water start on the south side of the transition area. Athletes will swim one loop of the course and exit the water at the same location as they entered. The course will have 4 yellow turn buoys and orange sighting buoys will be located approximately every 75 meters. The lake is fairly small in size so warms up quickly once the weather breaks, plus its a relatively short swim! A temperature reading will be taken and posted the Thursday prior to the event. If athletes don’t want to swim, a duathlon is option available. Bike Course: The Sprint bike course is a 14 mile ribbon of beautiful country. Once athletes leave the park there is exactly one turn, the turnaround point at the intersection of Main St. and Old Beaver Dam Rd. This is a beautiful course and a lot of fun to ride with views of marshes, pine forests and fields on either side of the road. The roads are well paved, have large shoulders most of the way and have very little traffic. Be sure to check out the bike course preview video HERE. Run Course: The Sprint run course is out and back on scenic, low traffic farm roads. There is no shade on this course, but you’ll see plenty of farm country and wildlife as you crush this completely flat course. Once you leave transition, you’ll cross main street and be in the country in about a 1/4 mile. It’s a beautiful run and not to be missed. There will be aid stations located every mile and mobile support if you need it. 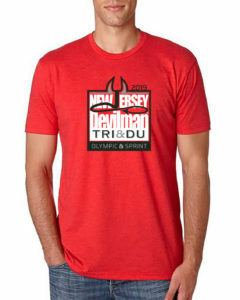 Duathlon: The Sprint Duathlon athletes will do a first run of 1 mile on an out and back run course. This course is flat and fast and starts at 8:00 with the rest of the Sprint athletes. The duathlon run course sends athletes out of the school lots, takes a right on Main, a right on Shaffer to the turnaround point. If you hit the train tracks, you have gone too far! You’ll love our swag! 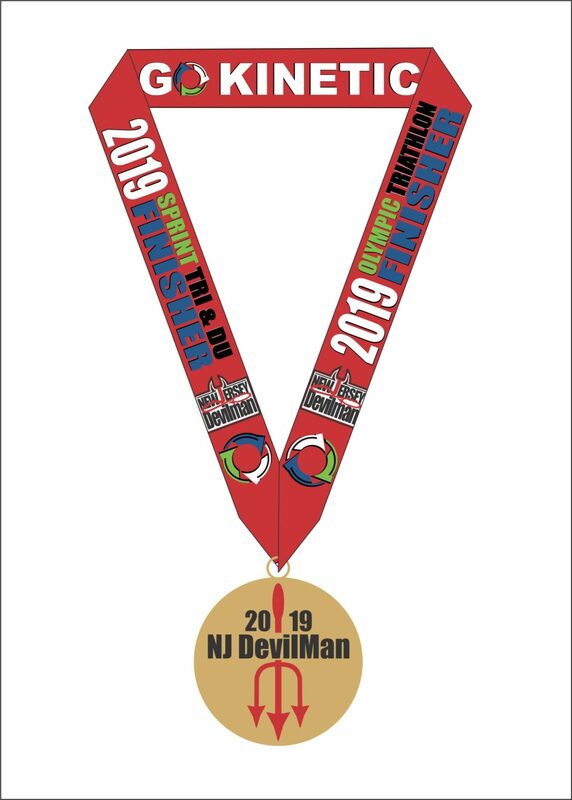 All athletes receive a Tri-Blend Race Shirt, Custom Race Socks and all finishers will get a Jersey Devil themed Finisher’s Medal. Also, don’t forget the DJ, bounce house for the kids and fabulous post race food. Race categories available for this race are Age Group, Aquabike, Relay Teams, Clydesdale, Master’s Clydesdale, Athena, Military, Collegiate, High School and Novice. All categories are scored 3 deep with Duathlon going 5 deep M/F and Masters M/F per event. All registered athletes will receive an email on the Wednesday or Thursday before the race with all the information pertaining to their entry to include bib numbers, wave start list with start times and any last minute details to make your race weekend go smoothly. Race Site Address: 225 Main St.
Pre Race Meeting: An extensive pre-race meeting will take place at 6 PM on Saturday. If this is your first race, come to this meeting to have your questions answered. A second brief meeting will occur 15 minutes prior to the first wave on race morning. Join a Triathlon Club! Training is more fun with friends, find a club near you using the USAT Club Finder.